Antop Omni-directional Antenna- No monthly bill for watching TV! The PL-414BG outdoor HDTV Antenna receives free broadcast HD Over-the-Air TV signals, such as ABC, CBS, NBC, PBS, Fox, Univision and others. Compatible with TV converter boxes or digital televisions/4K Ultra High Definition (4K UHD) TVs, which can be installed in various locations around the exterior of your home: wall, roof, and attic. It is also suitable for RV and mobile home use. Channel reception quality will vary depending on what's being broadcast in your area, how far away you are from broadcast towers, and your surroundings. BEFORE PURCHASING this antenna, please CHECK OUT what channels are available in your area via: dtv.gov/maps. 1)4G LTE Filter: Built into all ANTOP amplified TV antennas, blocks 3G and 4G wireless signals for noise-free digital reception. 2)Supports VHF / UHF digital signals. ANTOP ON-LINE CUSTOMER SUPPORT TEAM is Available Mon-Fri 9am to 5pm (pst), Offering ANTENNA SELECTION & INSTALLATION ASSISTANCE, etc. ANTOP products come with 30-day money back guarantee and 12-month warranty with friendly customer service. Visit www.antopusa.com for complete Warranty, Return and Replacement details. ✅ [360° OMNI-DIRECTIONAL RECEPTION]: Receives signals from all directions. No manual adjustment. No signal blind zone. Perfect for outdoor, attic, RV and marine used. 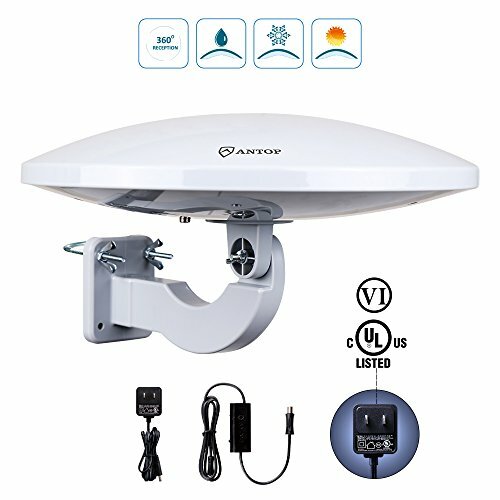 ✅ [WATERPROOF & ANTI-UV]: With high tech supported, this sleek durable antenna reduces wind load, providing much better signal reliability on windy or rainy day, anti-UV coating and provides visual appeal. ✅ [EXTRA LARGE ANTENNA DIAMETER]: Ensure the stability of signal reception, 15 inches long diameter wide range of super signal receiving and it can up to 65 miles without any obstacle, breathtaking streaming sound without the hassle! You can enjoying 4K picture quality smoothly. ✅ [SAVE ON INSTALLATION FEES]: Tools-free and easier installation. Compared with big size traditional yagi antenna, this modern antenna is much easier to install by included accessories without installation fees. ✅ [ENJOY 4K(>1080P) CRYSTAL CLEAR HD RECEPTION]: No more expensive cable or satellite fees, saving $1,000 a year. Antop outdoor HDTV antenna receives all of your local news, sports, kids, weather, etc, absolutely FREE.